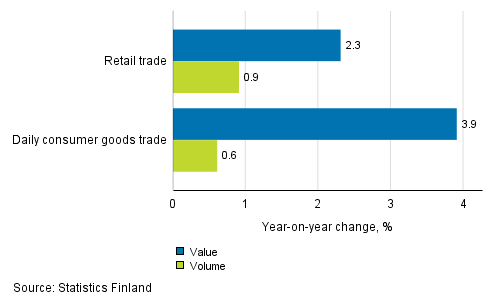 According to Statistics Finland’s retail trade flash estimate, retail trade sales increased by 2.3 per cent in July from July 2017. Over the same period, the volume of retail trade sales, from which the impact of prices has been eliminated, grew by 0.9 per cent. In daily consumer goods trade, sales increased by 3.9 per cent and the sales volume by 0.6 per cent in July from the corresponding period of the previous year. According to the Structural business and financial statement statistics, daily consumer goods accounted for 49.8 per cent of turnover in retail trade in 2016. The retail trade flash estimate is based on a sample covering, on the average, 60 per cent of retail trade turnover. Data on trade sales by industry will next be released on 13 September 2018. Flash estimates on retail trade are published at a lag of just under one month from the end of the statistical reference month. The preliminary data on motor vehicle, wholesale and retail trade based on a larger sample will be published at a lag of roughly six weeks from the end of the statistical reference month and the revised data based on total data are published at a lag of roughly ten weeks. ISSN=1799-0939. July 2018. Helsinki: Statistics Finland [referred: 22.4.2019].